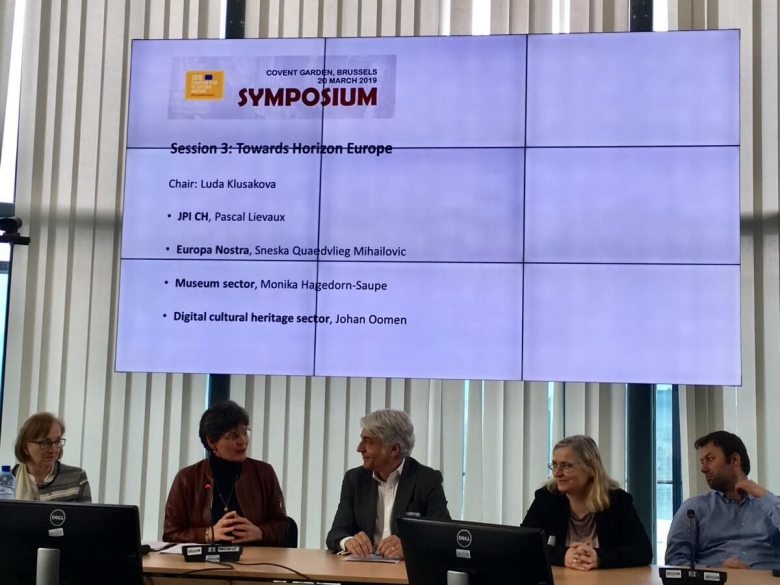 Europa Nostra actively contributed to the Symposium ‘Horizons for Heritage Research – Towards a Cluster on Cultural Heritage’ held in Brussels on 20 March 2019. The Symposium was hosted by the European Commission with the support of REACH (RE-designing Access to Cultural Heritage for a wider participation in preservation, re-use and management of European culture), a project funded by the European Union’s Horizon 2020 research and innovation programme. The Symposium gathered manifold research and heritage stakeholders from all over Europe and beyond, as well as EU policy-makers working on this realm. Europa Nostra, as the voice of cultural heritage in Europe, was invited to represent the civil society. The aim of the Symposium was to collect participants’ input and their vision for the future EU policy on heritage-related research. Ultimately, the outcomes of the Symposium will feed into the cultural heritage cluster of the upcoming EU Research and Innovation (R&I) programme, entitled ‘Horizon Europe’, which is currently being drafted and will run from 2021 to 2027. During the opening session, representatives of the European Commission framed the Symposium in the context of an unprecedented policy momentum for cultural heritage, resulting from the collective efforts and achievements of the European Year of Cultural Heritage 2018. Much was accomplished during this important European Year, and cultural heritage was effectively mainstreamed across different EU policies and funding programmes, including research and innovation. In 2018 alone, the EU invested a total of €66 million in R&I actions for the benefit of cultural heritage through ‘Horizon 2020’, the current EU programme for research and innovation (running from 2014 to 2020). European Commission representatives stressed that while capitalising on these outcomes, it is now time to reflect on the strategic direction of the future EU research agenda for cultural heritage. Europa Nostra, as the leading pan-European federation of heritage NGOs, was invited to present its position, priorities and expectations on this important topic. Sneška Quaedvlieg-Mihailović, Secretary-General of Europa Nostra, participated in a panel entitled “Towards Horizon Europe: Expectations from the cultural heritage sector”, where she voiced the need for EU-funded heritage-related research on behalf of civil society. During her intervention, Sneška Quaedvlieg-Mihailović welcomed the fact that civil society is consulted with and considered a key interlocutor in such a debate. She emphasised that civil society organisations are not only beneficiaries of EU-funded research related to cultural heritage, but also contributors that can enrich research projects with their wide expertise and experience-led knowledge. For example, schemes such as the European Heritage Awards / Europa Nostra Awards constitute a unique source of practice-led knowledge. “We are ready to contribute and do our part in shaping a meaningful research agenda, one that fully unfolds the cohesive power of our shared cultural heritage for the benefit of Europe and its citizens. You can count on us!’ she added. Europa Nostra’s Secretary General also called for a holistic approach to heritage-related research, abolishing silos and fragmentation between heritage types, knowledge producers and disciplines, and raised the need for people-centred approaches that benefit citizens and heritage communities first and foremost. Finally, she announced that Europa Nostra will soon issue a position paper on heritage-related research, reflecting the needs and expectations of civil society, which will serve as an advocacy tool to influence policies in this area. Other participants to the panel included representatives from the Joint Programming Initiative on Cultural Heritage (JPI Cultural Heritage), the Prussian Cultural Heritage Foundation (Stiftung Preußischer Kulturbesitz – SPK) and Europeana, who expressed their own views and expectations on this point. Throughout the day, participants discussed key topics linked to cultural heritage research, including both policy needs and thematic priorities. Europa Nostra, represented by its Secretary General Sneška Quaedvlieg-Mihailović, Vice-President Piet Jaspaert and Outreach Officer Lorena Aldana actively contributed to the debate. Participants discussed the need to establish a coordination structure to frame the dialogue between different research stakeholders, including scholars, practitioners, policy-makers and citizens. Such a platform would also allow knowledge-sharing between different projects, so as to avoid the duplication of work, and would foster the dissemination of results, cooperation and innovations. Concerning thematic priorities, participants agreed that heritage research should address key societal challenges, including environmental issues, sustainable development and digitalisation. Throughout the day, participants addressed the many dualities of heritage, including the intersection between cultural and natural heritage, how to converge institutional and bottom-up approaches, bridging local and European perspectives and complementing the digital and analogue dimensions. The main outcomes of the Symposium were further discussed during the high-level policy debate entitled ‘Cultural Heritage and the Cultural and Creative Industries in Horizon Europe’, held on 21 March and hosted by MEP Christian Ehler, who is the rapporteur of the Horizon Europe proposal in the European Parliament. A written report of the Symposium will be prepared, as to capture the vision and expectations of participants on European research and innovation policy for cultural heritage beyond 2020. In the meantime, Europa Nostra will continue working on this relevant topic and will contribute to future public discussions. The outcomes of these efforts will be captured in a position paper that will be published shortly. Stay tuned for further developments! In June 2018, the European Commission published its proposal for Horizon Europe, the EU programme for Research and Innovation from 2021 to 2027. With a budget of €100 billion, this is the most ambitious R&I EU programme ever. Horizon Europe will succeed Horizon 2020, the current EU programme for research and innovation. So far, the EU has invested over €300 million through Horizon 2020 in research and innovation in cultural heritage, and at least €200 million more will be invested between 2018-2020.